I bought the 13" unibody MacBook one month prior to it's upgrade to become the new improved 13" unibody MacBook Pro (with unopenable battery compartment, extra 3 hours of battery life, more color gammut, SD slot, firewire 800 port, and a new 8Gb memory limit). My MacBook says it is limited to 4GB of DDR3 1066mhz memory, in 2 SO-DIMMs. But that was written back when you couldn't get 2 4GB SO-DIMMs. Now that you can get them, the very similar MacBook Pro is shipping with 4GB standard, and can be upgraded to 8GB. I've asked (Apple reps), and I'm repeatedly told that my model cannot be upgraded to 8. When I ask for the reason they alway say: "Because that's the published limit at the time your mac was built." I find this unconvincing. If they said: "Because the memory controller in the chipset is limited to 4GB, despite being seemingly identical to the memory controller in the same chipset newest MacBook model," then I'd just take their word for it. Has anyone tried it, or found any research as to whether two 4GB DDR3 1066mhz SO-DIMMs can be installed in the unibody MacBook without FireWire? I just found that there IS a way to get the late 2008 macbooks up to 8GB RAM. Apparently Apple released a firmware upgrade to fix a problem with the optical drive that also expanded the memory limit to 8GB. Check out this posting on 9to5mac. In case the link is down, here is a summary of what to do. Check the Boot ROM Version in your System Profiler. MacBook Pros with a Model ID of MacBookPro5,1 should have a Boot ROM Version of MBP51.007E.B05. Apple does limit the motherboard on certain models. For example 4GB of RAM was only available on the previous model White Macbook from the 3rd iteration. During each refresh they change the motherboard being used on the base model and this is generally the reason for the restriction. The series you have definitely does not support 8GB as we went through the exercise at work after upgrading one of the newer models. It will only read the first 4GB of RAM. The October 2009 unibody aluminium Macbooks supports 6GB (4+2) of RAM without any problems. 8GB doesn't work, though. I tested it with 2x4Gb DDR3 at 1333MHz. It didn't work. I don't know if it was because of the RAM speed which wasn't supported by the board or if the board doesn't support the amount of RAM at all. By the way, I also tried putting only one of the DDR3 DIMMs and it did the same (the power light kept blinking and a beep every two seconds). I haven't tried with a set of DIMMs at 1066MHz. Also, I tried this 2x4Gb@1333MHz kit with an unibody aluminum 13" 2.26GHz MacBook Pro that uses the same memory as the white unibody macbook and it did work, and on the "About this Mac" dialog it said the RAM was working at 1333 MHz. I think since the MacBook Pro has the FireWire and SD interfaces, they might just be different boards and being the white MacBook a cheaper one with limited functions to 8 Gb OR this "different board" can't support a bus speed above 1066 and the RAM I tried can't work at that (not too feasible but this would keep my hope to be able to somehow upgrade to 8 Gb). 13" Aluminum MacBook can run two 4GB 1066mhz sticks for a total of 8 GB, for some reason it shows my speed as 1333mhz in the system profiler but that is not the speed of RAM that was installed, still, 8GB of RAM! 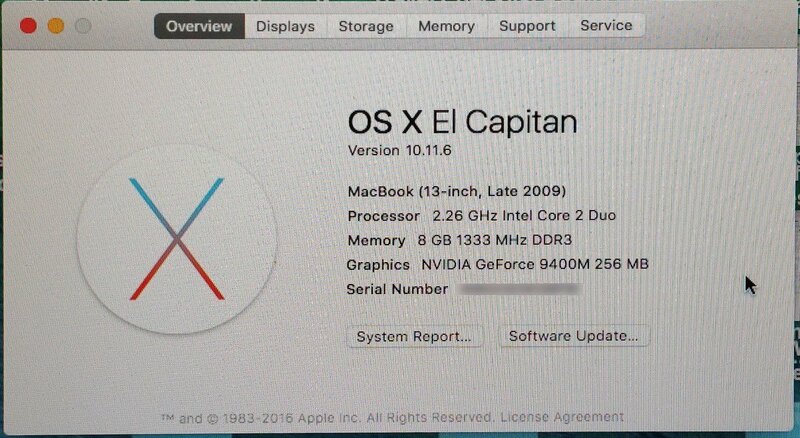 I've discovered through experimentation that my white 13" MacBook Unibody Late 2009 A1342 updated to OS X 10.11.6 (El Capitan) can now run 8 GB (2×4 GB) of DDR3 1333 SODIMM taken from my Lenovo Y570 laptop. I had previously been running it on 4 GB (2×2 GB DDR3 1066). Not the answer you're looking for? Browse other questions tagged memory macbook ddr3 memory-limit or ask your own question. How can I increase the performance of Mac OS X? Why is ram for the new macbooks so expensive? Is there a way to tell the model number of a Mac or Macbook?